Why Palladium for an Engagement Ring? Palladium is the hottest trend in rings right now. Palladium is a naturally white precious metal. It is in terrific demand. Palladium engagement rings have risen drastically in popularity. Many people like the look of a white metal in their jewelry, but they want something more precious than sterling silver. White gold has been the choice for some time, but therein lies a problem. Gold is naturally yellow in color. To make white gold, a jeweler must essentially bleach out the metal by adding in lesser metals. Gold must be dipped in another metal in order to have the white look. Sometimes, the gold that wears off and the ring needs to be re-applied. Palladium is a harder metal than gold and will not lose its color. When comparing palladium and white gold, palladium will outwear white gold by 15%. If filigree work is desired, palladium is a much more durable and practical choice for the jewelry. Palladium engagement rings will hold their color for the lifetime of the ring. Which Color: White or Yellow? More couples in today’s market opt for white metal settings for their engagement and wedding rings. Palladium engagement rings are known for their extremely white color. White metals certainly show off the beauty of diamonds and gemstones. In fact, many people believe that white metals make diamonds look even larger than they are. Many people feel the impact of the clear white metal of palladium paired with a diamond is nothing short of stunning. An engagement ring set in palladium will be nothing short of spectacular. In recent years, platinum has been the choice for couples looking to have a white metal engagement ring. However, palladium’s affordability makes it the better choice. Palladium is not a brand new metal. It has been used as a white metal setting in diamond engagement rings since the year 1939. During World War II, palladium gained a lot of popularity due to the scarcity of platinum. Many couples opted for palladium settings to attain the white metal look they loved. Palladium is, in fact, whiter than gold and white gold. Palladium engagement rings have the brilliant look of white metal. Palladium is not as heavy as platinum, yet it is 12% harder than platinum. A ring with a more elaborate and intricate design will be heavier by design. An ornate ring made from platinum will weigh even more. The lightweight nature of palladium makes it more wearable than other metals, especially when the ring has a wide band. Palladium is highly resistant to weather and heat. It also does not tarnish. As a result, palladium is the metal of choice for more than just palladium engagement rings and wedding bands. Televisions, computers, cell phones and other electronic equipment often utilize palladium for its resilience and sturdiness. A palladium engagement ring will not bend or become marred by day-today activities in the same way gold or white gold can. Those who use their hands in their work appreciate the durability of palladium. Palladium is especially hypoallergenic. Many people struggle with white gold and yellow gold. The reason is because of an allergic reaction to the nickel added to the gold. Palladium does not provoke allergic reactions. Palladium engagement rings will appeal to any bride to be who tends toward allergic reactions. Many quality, timeless and unique palladium engagement rings and wedding bands designed in the 1940s are resurfacing in estate sales and antique shows. These rings are being snapped up by couples seeking something exceptional and distinctive. The interest in estate sale jewelry and tasteful palladium engagement rings has sparked a renewal of new palladium rings fashioned by contemporary jewelers. Because of the ductile nature of this metal, it can be used to create imaginative styles and one of a kind rings. For this reason, jewelers use palladium to create engagement rings that are beyond compare. Palladium is much cheaper than platinum. A single ounce of platinum is nearly $2000, while palladium weighs in at under $450 an ounce. The thicker and wider the band, the more the cost of a platinum ring will be driven up. On the cost scale, palladium is slightly more expensive than gold and significantly less expensive than platinum. If a platinum engagement ring is purchased, the wedding band will also be platinum. That significantly drives up the cost of the wedding jewelry. The less money spent on the metals used to set the diamond, the money that can be funneled to the cost of the actual stone. Palladium is actually 15 times more rare than platinum. It is considered part of the platinum family. It is known for its resistance to corrosion. This makes palladium engagement rings more hard-wearing and long-lasting than white gold, gold, or sterling silver. Platinum and Palladium are nearly indistinguishable to the naked eye. The luster and color are extremely comparable. With the look and sheen of platinum but at a quarter of the cost, palladium is far too large a deal to pass up. Palladium engagement rings and wedding bands are priced for nearly every groom’s budget. A groom shopping for a palladium engagement ring can procure a lovely creation for less than $600. Yet there are also palladium engagement rings and wedding bands on the market for thousands of dollars. There are numerous online jewelers reveling in Palladium’s current renaissance. Etsy.com offers a stunning 1 carat VS1 Asscher Cut diamond with a hammered palladium band for $15,000. 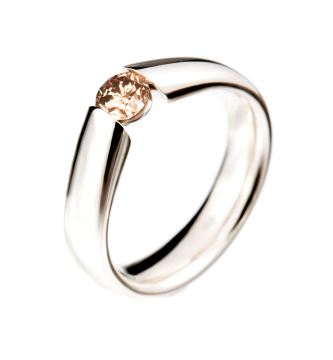 This startling ring will look stunning on any bride’s finger. Danforthdiamond.com offers an individualized palladium engagement ring. The band sports sixteen 1.5 milimeter, round blue sapphires arranged in four diagonal lines on the shoulder. The purchaser may choose the size of stone. The stone can be in a variety of sizes and cuts, depending upon the preferences of the bride and groom. The ring without the center stone will run $445 dollars. To provide some context, the same mounting with the sixteen 1.5 millimeter, round blue sapphires arranged in four diagonal lines on the shoulder of the ring made from platinum—which will look exactly like the palladium version—will run $805. That is a tremendous savings that can be applied toward the cost of the center stone and will buy a nicer diamond. J.R. Dunn Jewelers online offers a number of unique and dramatic designs of palladium engagement rings. A ring with two bands meeting in a symbol of unity with half a carat of pave set brilliant diamonds scattered along the band embrace the center stone. This ring will cost a bit less than $2500. A bride wearing this palladium engagement ring will surely draw many compliments on her ring. Gemnation has a striking array of palladium engagement rings. This jeweler offers a three stone palladium engagement ring with a half carat in side diamonds. The purchaser may select the size and cut of the center diamond. For $5,650, a groom may select this ring and then choose a center stone worthy of his bride. Robbins Brothers jewelers carry a palladium engagement ring with channel set baguette diamonds for $1450. Ben Bridge Jewelers online offers for purchase a Scott Kay palladium engagement erring with mill grain detail and princess cut and round diamonds totaling 5/8 carat total weight. The center stone would be selected by the purchaser. The setting as described runs $2890. Antique Jewelry Mall allows the groom to find a beautiful palladium engagement ring setting. A groom can choose an art deco filigree antique style engraved on the outside of the band with a geometric pattern littered with 24 diamonds on the band. This setting is appropriate for a half-carat center stone and can be purchased for $1355. Fay Cullen carries antique, vintage, and estate jewelry. Many palladium engagement rings can be found from this jeweler. EBay has a dynamic assortment of estate and vintage palladium engagement rings for auction. Scott Kay, a big name in jewelry, has publicly stated his preference for palladium for use in engagement rings. Many remarkable rings are crafted from palladium. They can be found from this jewelry designer. Ritani is a trusted name for palladium engagement rings. The unusual and dazzling designs found by this designer are surprising and breath-taking. Ritani can be found through numerous vendors. How to find the Best Ring for the Best Woman? When a groom-to-be has found a bride-to-be, the perfect ring is necessary. No proposal is complete until the ring seals the deal. However, choosing the right ring can be nerve-wracking and anxiety-filled. Men can eliminate some of the guesswork by creating situations during which to gather information regarding her preferences in terms of size and cut. Many brides even prefer a different stone in lieu of a diamond. To be certain the ring in question will be the ring of the bride-to-be’s dream, gathering some intelligence on the sly, is crucial. Ultimately, as much as grooms worry about choosing the “right” ring, most women will agree that the “right” ring is the ring that comes from the “right” guy. In other words, when the man of their dreams gets down on one knee and pops the question, most women fall in love with the ring in the box on principle.